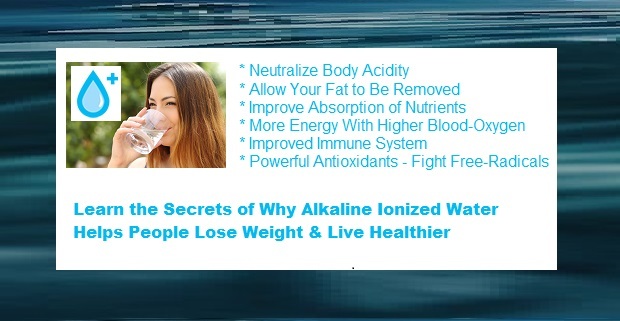 The first secret of why people can lose weight more easily when drinking alkaline ionized water (than drinking any other beverages) lies in the pH balancing of the body. Most people’s diets are overly acidic anyway. But this is even more the case when dieting. In addition to eating acidic foods, the dieting person is also trying to release/burn stored fats, which creates a lot of acidity. An off-balanced pH of the body has been known to cause diets to fail and/or “weight-loss plateaus” to happen. Burning fat can cause a dangerous condition called metabolic acidosis (an overly acidic body). For this reason one should never diet without also trying to balance the body’s pH. To fight acidosis (acidity) one needs to provide a source of alkalinity. Drinking one glass of alkaline ionized water by itself will not significantly alter the pH of the body, but sipping on alkaline ionized water throughout the day will provide a constant stream of buffers to help you overcome the tendency toward acidity that necessarily comes with fat-burning-diets and allow the body to lose weight more safely. Alkaline ionized water helps you absorb nutrients better and faster. The micro-clusters of H2O can circulate faster and enter cells faster and more efficiently than other water or beverages. Along with that, when nutrients enter cells, wastes are then removed. Water, in particular if it’s micro-clustered, is a terrific catalyst for absorption of nutrients. Naturally when you’re dieting, you are eating far less and getting fewer nutrients than when not dieting. For this reason it is important to make every calorie count to bring the most nutrients possible to your body, in order to stay healthy. The additional energy that people experience from drinking alkaline ionized water is another great feature of it that assists someone who is dieting. Dieters often experience fatigue while dieting. But drinking alkaline ionized water has been known to boost energy. One of the theorized reasons why people (including myself) feel more energized while drinking alkaline ionized water is because they’re getting greater amounts of O2 in their blood supply, cells, tissues and brains. Dieting can put a stress on the immune system, but when drinking alkaline ionized water many thousands of people, including myself, are claiming that their immune systems are so great they don’t get sick anymore. Immune support is even more important to dieters than non-dieters, to combat all the immune system stresses that tend to be created with sustained fat-burning diets. Cathleen was a teacher/principal for 24 years and has been drinking ionized water for about 25 years. She created Alkaline Water Plus to educate people about the benefits of ionized water. Search results are always reported with two tabs: "Products" first and "News & Information" second.Look for these tabs.